This book explains how the GSM system has been modified to provide GPRS, EDGE, and EGPRS mobile packet data services. Explained are the GPRS and EGPRS packet control channels and gateways to the GSM system to provide a maximum delivered packet data transmission rate of approximately 474 kbps. You will learn how EDGE is an evolved version of the GPRS radio channel that uses new phase modulation and packet transmission to provide for advanced high-speed EGPRS data services. This figure shows how a GSM system can be upgraded to offer GPRS services. This diagram shows that an existing GSM channel is removed, replaced, or upgraded to have GPRS and EDGE/EGPRS modulation and transmission capability. This diagram shows that packet control unit (PCU) must be added to the base station controller (BSC) and packet data switching nodes and gateways must also be added to allow data packets to be routed between mobile devices and data networks (e.g. the Internet). This figure shows how a GPRS system uses multiple addresses to allow IP datagram packet to transfer between the end user an Internet web sites. 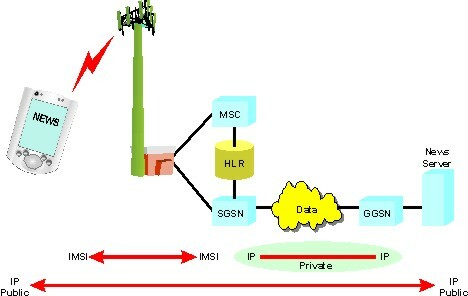 This example shows that the end user mobile data device uses its IMSI to communicate with the SGSN. The SGSN links this IMSI to a private IP address that routes the data packets to a gateway router. When the data packets reach the GGSN, they are linked (mapped) to a public Internet address that allows the packet to reach its destination. Bryan Hashim Strange has performed a wide range of technical and managerial roles for 12 years at Wray Castle. This began with four years lecturing on a variety of engineering and academic modules for HND students, as a trainer and course developer for short courses based on European second and third generation technologies. These courses include UMTS System Overview, UMTS Air Interface, UMTS Cell Planning, GSM Air Interface, GSM Cell Planning, GSM Optimisation, GSM Indoor Coverage Planning, GSM Applied Cell Planning and GPRS. He has also developed and presented courses covering other global technologies such as cdmaOne, CDMA2000, TETRA, APCO 25, iDEN, WLAN and Bluetooth. Mr. Strange was educated in the United Kingdom at Clayesmore School (1976-1984) and Wray Castle College (1987-1990) and Lancaster University (1999 -2000). He also specializes in HNC Electronics and Communications Engineering and he has a Marine Radio General Certificate. Bryan Strange also holds 3 �A� Levels; Maths, Physics, Engineering Drawing and Design plus 9 �O� Levels; inc. Maths, English, Physics. The GPRS system allows cellular service providers to upgrade one or more GSM radio channels (with changes) to provide broadband medium-speed and high-speed data services to their customers. GPRS and EGPRS technology is an "always-on" system that allows users to browse the Internet without complicated dialup connections. You will discover that the key types of GPRS and EGPRS devices include external radio modems, wireless PCMCIA cards, embedded radio modules, and mobile telephones. External radio modems allow the customer to simply plug in their GPRS device to their USB or Ethernet data port to their desktop or laptop computer. GPRS PCMCIA cards can be added to most laptop computers or embedded radio modules allow devices such as PDAs and Laptops to integrate high-speed wireless without adding PCMCIA cards. Some mobile telephones include both GSM (voice and low speed data) and GPRS (high-speed packet data) capability. Because the needs of voice and data communication are different, the operation of the GSM radio channel is different. GPRS devices can have single mode (only GPRS/EGPRS) or dual mode (both GSM voice and GPRS data) capability. You will discover how the GPRS system was modified using EDGE technology to increase the 171.2 kbps GPRS maximum data transmission rate to 474 kbps EGPRS data transmission rate. This book provides the basic technical components and operation of GPRS technology. You will learn the physical radio channel structures of the GPRS system along with the basic frame and slot structures. Described are the logical channels and their functions. Explained are the key GPRS network components and how they communicate with each other. Explained is the fundamental capabilities and operation of the GPRS and EGPRS radio channel including asymmetric data rates, modulation types (GMSK, 8-PSK), and how GPRS devices can use either GSM or GPRS control channels to setup and manage packet data communication sessions. 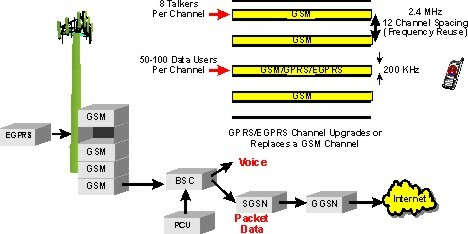 You will discover how a packet control unit (PCU) coordinates the allocation of GSM voice channels and GPRS/EGPRS packet data channels and how a single GSM radio channel can provide up to 8 simultaneous data sessions and how many other users (possibly 80 per channel) can be added who have a 10% usage activity factor.